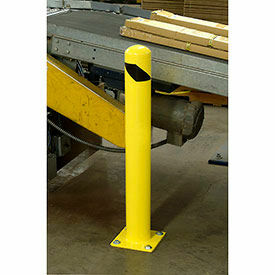 Global Industrial™ Steel Bollards Protect Machinery, Racking, and Personnel in Heavy Machinery Environments. Global Industrial™ Steel Bollards are made of heavy duty steel welded construction with a removable plastic cap that can be filled with concrete for reinforcement. 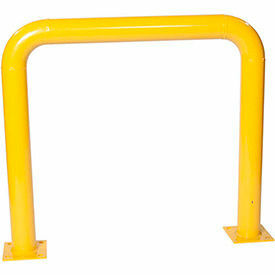 Safety yellow powder coat finish is highly visible. 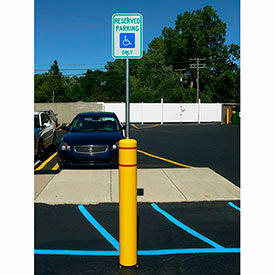 Available styles are Safety Bollard, Safety Bollard/Plastic Cap/Chain Slots, and Safety Bollard - Removable. Several mount types available. Global Industrial™ Steel Machine Guards Protect Machines, Racks, loading Docks, Security Areas and more. Global Industrial™ Steel Machine Guards are made with heavy duty, welded steel to withstand heavy machinery environments. Safety yellow powder coat finish and black visibility stripes provide high visibility and safety for workers. Detachable base plate design allows quick and easy guard removal. Removable plates have a pull-out side that allows the rack or bollard to slide out of the mounted position temporarily to provide full access to machines, racks, loading docks, and more. Detachable base features a padlockable hasp for security when in place (lock sold separately). Base plates anchor to floor for stability. Available styles are Machinery Guard - Floor Mount and Machinery Guard - Removable. 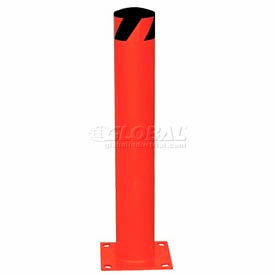 Heights are 36" and 48"
Heavy Duty Welded Steel Makes These Safety Bollards Used For Protecting Personnel, Racking And Machinery Indoors And Outdoors. Security bollards include a removable cap that allows bollard to be filled with concrete for extra reinforcement. Base plates include 4 openings to accept mounting bolts (sold separately). 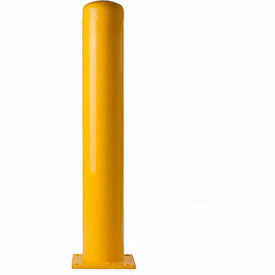 Steel bollards have a high visibility yellow powder coat finish. Choose from 2 styles: Existing Concrete Bollards allow floor anchoring and Underground Bollards install in fresh, wet cement. Removable Cap Bollards with Chain Slots connect to other bollards using an option Steal Chain to create a barrier. Machine Guards have a Detachable Base Plate Designed for Quick and Easy Guard Removal. Machine Guards have removable plates with a pull-out side so the rack or bollard can slide out of the mounted position to provide full access to machines, racks, loading docks, security areas and more. Base plates measure 12-1/4" x 12-1/4" x 3/4" and allow floor anchoring for stability. 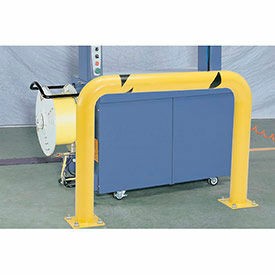 Safety machinery guards are made with heavy duty welded steel for lasting durability. Tube diameters are 4", 4-1/2", and 48-5/8". Machinery Guard heights are 24", 36" , and 42". Lengths are 36", 48", and 48-5/8". Machine Guards available with or without padlockable base. Guards have safety yellow powder coat finish with black visibility stripes. Mounting kit sold separately. All 42"H models include a 21"H mid-rail to comply with OSHA requirements. 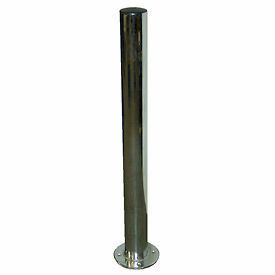 Stainless Steel Safety Bollards Help Protect Warehouse, Parking And Loading Areas from Impact Damage. Stainless Steel Safety Bollards are made with galvanized steel or type 304 stainless steel for lasting durability and corrosion resistance. 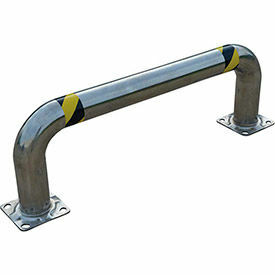 Available styles are Safety Bollard and Threaded Bollard. Bollard heights are 24", 32", 36", and 42". Lengths are 4", 6", and 8". Tube diameters are 4", 4-1/2", 5", and 6-5/8". Triple Elbow Corner Wall Guards Fit Snug Around Corners To Protect Machinery, Buildings And Offices. Triple Elbow Corner Wall Guards are made with heavy duty welded steel for years of durability. 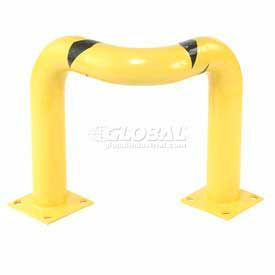 These safety guards have a scratch resistant yellow powder coat finish with black 3 W safety stripes for high visibility. Triple elbow corner guards are constructed of 4 schedule 10 steel pipe with 4-1/2 outer diameter. Welded base plates measure 8 x 8 with 7/8 x 1-1/4 slotted bolt holes that allow floor anchoring. Concrete mounting kit sold separately. 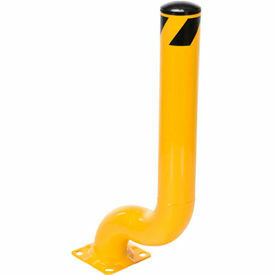 Choose Special Designed Bollards To Meet Your Needs - Removable Bollard; Movable Bollard or Shelf Storing Bollard. 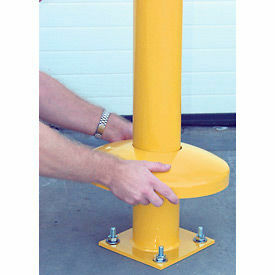 Durable steel bollard with yellow powder coated finish. 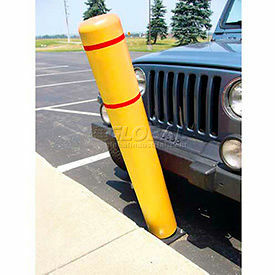 Removable Bollard includes mounting sleeve that can be set in concrete to hold bollard. Bollard easily detaches from sleeve to allow access into blocked off area. 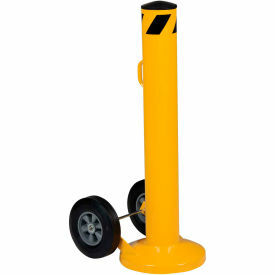 Movable Bollard features two 10 diameter mold-on rubber wheels for easy mobility where you need it. Used for temporary applications. 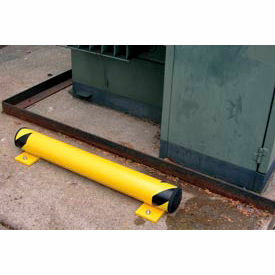 Self Storing Bollard is designed to slide down into the ground or floor when not needed. Includes sleeve that sets into ground with concrete. 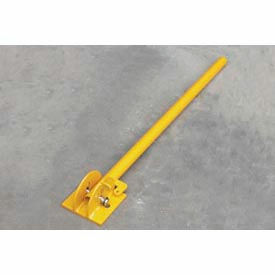 Bollard includes a handle on top for easy lifting and lowering. Simply lift and twist for raised position. Includes padlockable tab for security (lock sold separately). These Safety Bollards Feature An Innovative Spring-Loaded Design That Stops Vehicle, Bends To Absorb Impacts And Reduces Bollard Damage For Longer Life. 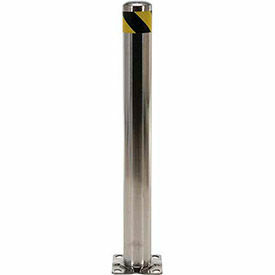 Steel safety bollards features spring-loaded base that allows bollard to be repeatedly contacted without damage. 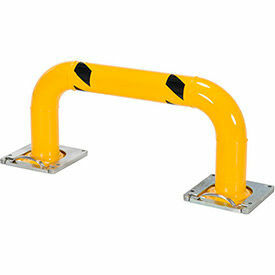 Safety bollard has a yellow powder coat finish for high visibility. Measures 42 H x 2-1/2 diameter. Siren/Strobe Bollard gives off a visual and audible warning when tilt sensor is triggered. Operates on two 9 volt batteries (not included). 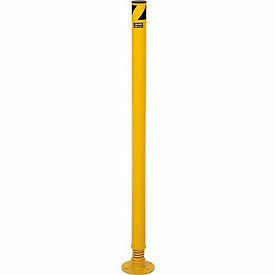 This safety bollard includes an on/off switch, an amber safety strobe lens and provides at least 100dB at 1 foot, which is audible in the noisiest environments. Hide Unsightly Bolts And Hardware On Bollards To Maintain An Attractive Appearance. Plastic Caps for Bollards snap over the top of anchor bolts and washers to protect them from weathering. Sold 4 per package. Protective Dome Cover for bollards prevents accidents and injuries caused by tripping over raised bolts. Steel cover slides over bollards to hide and conceal base plates and mounting hardware. Yellow powder coat finish. 14 diameter x 3 H.
Floor Stop Bollards Prevent Unwanted Access To Forklifts, Pallet Trucks And Other Wheeled Machinery For Security And Maximum Protection. These floor bollards feature a unique design that provides optimum strength and protection against hard impacts and crashes. 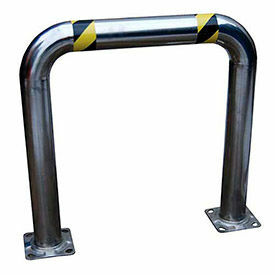 Safety floor bollards are made from 4-1/2 diameter heavy duty welded steel. 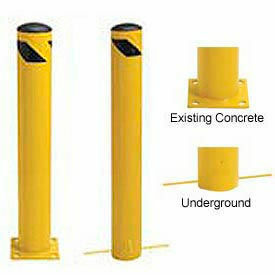 Security bollards include removable rubber end caps that allow bollard to be filled with concrete for extra reinforcement. Base plates are pre-drilled to accept mounting bolts (sold separately). 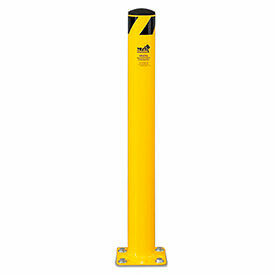 Steel floor stop bollards have a high visibility yellow powder coat finish with black stripes on edges. Chrome Plated Bollard Improves The Appearance Of Your Facility While Protecting People And Equipment. Durable steel has attractive bright chrome plating for a clean, fresh look. Steel bollard includes a removable black plastic top cap. Cap is removable to allow bollard to be filled with concrete for greater strength and stability. 8 diameter mounting plate is pre-drilled with four 1/2" diameter holes for quick and easy installation. Bollard measures 42 H x 4 diameter. Concrete Anchor Bolts sold separately. 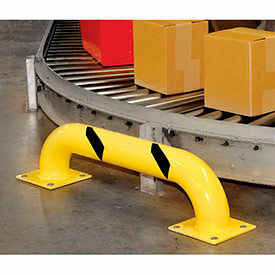 Steel Corner Rack & Machine Guard Are Used For Protecting Equipment And Racking From Fork Truck Impacts. 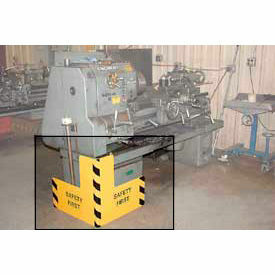 Steel Corner Rack & Machine Guard are constructed of heavy gauge steel machine guards and yellow powder coat finish with black stripes and "Safety First" message for high visibility and for long lasting durability. Safety guards include 3 lag down tabs with 7/8" diameter openings. Mounting hardware sold separately. Available sizes are 16" H Center 16" L X 8" H Side and 24" H Center 24" X 12" H Side. Concrete Kit is also available. Petersen Mfg Concrete Bollards are Installed to Control Traffic and Protect Vehicles in Parking Lots, Parks, and Facilities. 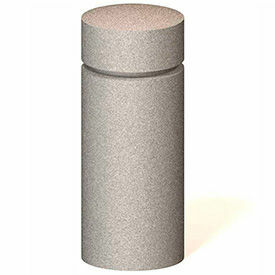 These concrete bollards provide protection and define perimeters in open traffic or parking areas. Concrete and filled concrete bollard styles include Decorative, Handicap Marker, Round, Square and Tapered Round concrete bollards. Bollards can be mounted with a protruding pipe into hole/concrete, or with an over existing steel pipe. 8 color finishes available. Dimensions vary. Stainless Steel Machine Guards are Corrosion Resistant for Parking and Loading Areas, and other Outdoor Use. Stainless Steel Machine Guards protect pallet racks, machinery and personnel. High profile guards are made with 304 stainless steel with a polished surface finish. Corrosion resistant stainless steel safety guards are ideal for outdoor applications to help protect warehouse, parking and loading areas. All welded 4-1/2" diameter stainless steel adds structural integrity and heavy duty impact protection. Base plates on all models measure 8" x 8". Meets NSF/ANSI 51-2009 standard for use in non-food and splash zone environments within the food industry. Mounting kits sold separately. Dimensions vary per model. FlexBollards® combine bollard covers with flexible posts to dramatically reduce maintenance and replacement costs for bent and disfigured posts and bollards. FlexBollards® use a galvanized steel post and a durable spring that allows super flexibility when they're hit from any angle. Protect your equipment and assets with Steel plated bolt-down bollards. Great for industrial, access control, and electrical protection. Includes installation bolts. Schedule: 40.